I knew Belgrade was the party city, but I had no idea it was so green! Virtually every road was lined with avenues of trees, the flower boxes overflowed with bright colours and there are innumerable green parks. I loved the funky little coffee shops and even the graffiti on the walls was excellent. 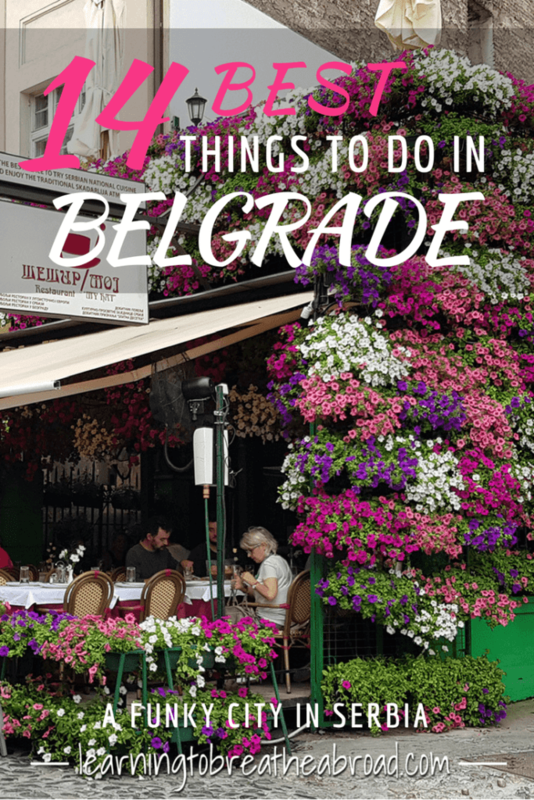 We found so many things to do in Belgrade, so here’s our list of places to visit in Belgrade. TIP: We caught the local bus from our camperstop into the centre of Belgrade, but the bus driver refused to take our money, not that I was complaining. I later read that no one pays for public transport in Belgrade and it made me realise that I hadn’t seen anyone paying for their bus trip. So much for thinking we were special! The Belgrade Fortress sits high on the hill overlooking the confluence of the River Sava and the Danube River. More than 100 battles have been fought here causing the fortress to be rebuilt more than 40 times since its initial construction in 1AD. Most of what remains were built in the 18th Century by Austro-Hungarians. The Fortress consists of Upper Town, Lower Town and Kalemegdan Park. 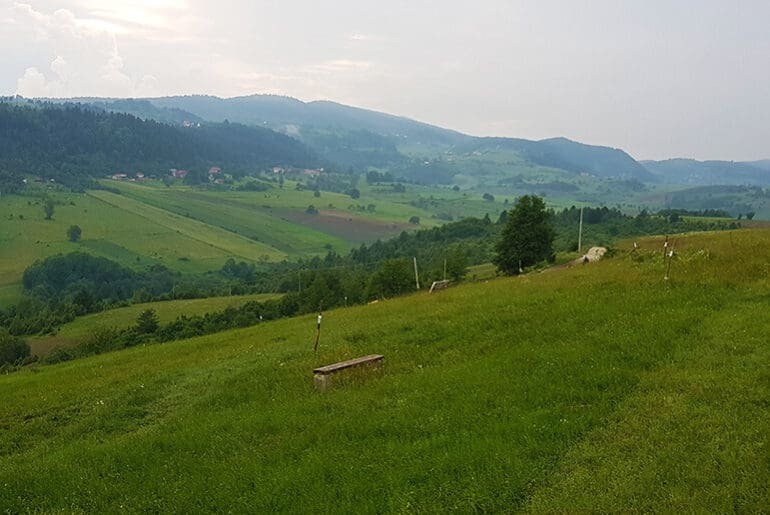 The most preserved parts of the fortress can be found in the Upper Town and this is where you will find the Military Museum, Clock Tower, St. Petka church and Ruzica churches, the Roman Well and the statue of Pobednik “The Victor”. The statue of Pobednik stands on a platform with an unparalleled view of the two converging rivers. The sunsets from here are simply stunning, so try and time your visit appropriately. The Lower Town was once a thriving medieval city on the banks of the river, but virtually all of the buildings have been destroyed in various sieges and bombings. Kalemegdan Park now is a huge expanse of lawns and shady trees but was originally cleared of trees to allow for an unobstructed view of the advancing enemy. It was also used as a used as a battlefield in front of the fortress. Kalemegdan Park is split into Great Kalemegdan and Little Kalemegdan. Great Kalemegdan occupies the Southern part of the fortress, while Little Kalemegdan can be found in the Eastern quadrant bordering the urban areas of Belgrade. The Park is full of random sculptures, an amusement park, a zoo and a fantastic kids playground area. Benches are dotted along the walkways with numerous trees offering shady relief from the heat of the sun. Men sit playing chess, while people stroll the walkways and kids run free. It’s a great place to hang out. Republik Square is the central square in Belgrade and the main meeting point for locals and tourists alike. The free walking tour of Belgrade meets under the horse at 11 am and 4 pm every day of the year. The statue is of Prince Mihailo on his trusty steed. There are four fountains in the square, as well as the National Theatre, National Museum and numerous cafes. 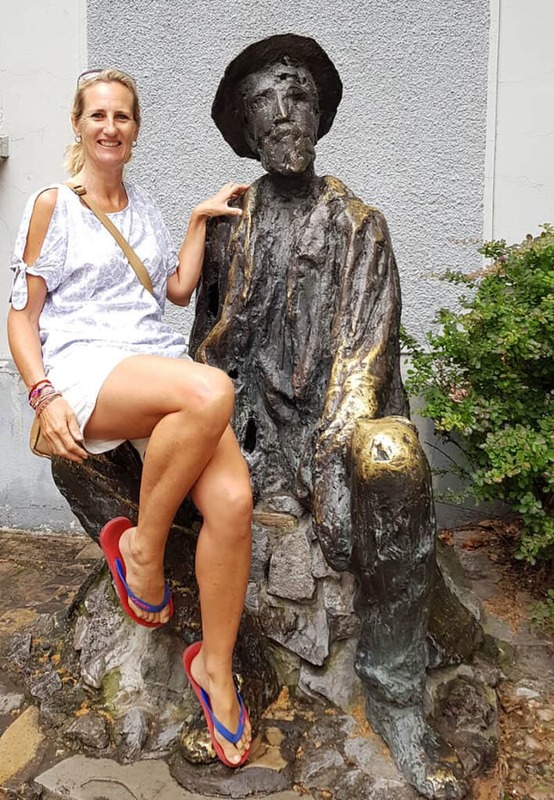 Often compared to Paris’ Montmartre, Skadarlja Street is the main bohemian quarter of Belgrade and probably the best bohemian street in the world. After the Belgrade Fortress, Skadarlja Street is the second most visited tourist attraction in Belgrade and with good reason. This little-cobbled street lined with famous restaurants is a feast for the eye. The restaurants are adorned with hundreds and hundreds of the most vibrantly coloured flowers every imaginable. I’ve never seen something quite so beautiful in my life. Due to its proximity to the National Theatre this narrow whimsical street became the bohemian quarter as many actors, writers and journalists would gather here to dine, relax and enjoy the inspirational atmosphere. Despite being a tourist hub, the restaurants were all very reasonably priced. We found the portions huge and even sharing a meal, we couldn’t finish it between us. Terazijska Fountain is located in front of the famous Hotel Moscow and provides drinking water to the residents of Belgrade. It was built in 1860 to commemorate the return of Prince Milos Obrenovic to the throne. The House of the National Assembly of the Republic of Serbia is the seat of the National Assembly of Serbia. This majestic building can be found on Nikola Pasic Square in downtown Belgrade and is a landmark and tourist attraction. 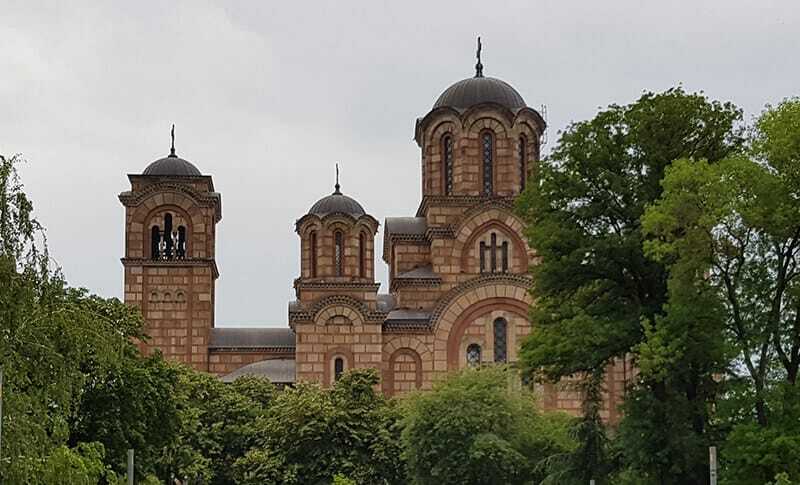 Based on the design of Kosovo’s GraCanica Monastery, this magnificent five-domed church is an architectural wonder and was the largest church in Serbia until work commenced on the Sveti Sava church. Despite construction beginning more than 70 years ago, the interior is still not complete, but it does house some of Serbia’s most priceless icons. It is located very close to the city centre in Tasmajdan Park. If you’re traveling with kids, Tasmajdan Park has big playgrounds and lots of popcorn and candy floss stalls, which the kids might love! The Tesla Museum is an absolute must see if you are in Belgrade. It is an interactive experience showcasing 3D computer-generated models of Tesla’s inventions and predictions for our technological future. Nikola Tesla was a Serbian American inventor, electrical engineer, mechanical engineer, physicist, and futurist who made dozens of breakthroughs in the production, transmission and application of electric power. He is best known for his contributions to the design of the modern alternating current electricity supply system. The museum is open every day except Monday from 10am-6pm. English tours are 500 Serbian dinar and last 30-40 minutes. The Cathedral of Saint Sava is one of the largest Orthodox churches in the world and one of the largest church buildings in the world. From the outside, it is incredibly impressive with pretty gardens and fountains bubbling in front. Sadly, the interior was under construction during my visit but the dome was exposed and really impressive. On the walking tour you will see the following sights: The Republic Square, the National Theatre and the National Museum, Bohemian Quarter (Skadarlija), the oldest part of Belgrade with Ottoman heritage, the oldest residential house and museum of Serbian language, the only mosque in the city, Zoo, Kalemegdan park, Belgrade fortress, „Victor“ the most famous symbol of Belgrade, the confluence of the Sava and the Danube rivers, Saborna church, cafe „?“ and Knez Mihailova street. Lookout for the guides wearing yellow tops and ID’S. Just look for something yellow. The tour ends in Knez Mihailova street, very close to the Republic Square. Rakija (pronounced RA KEE YA) is the Serbo-Croatian name given to an alcoholic drink made from the distillation of fermented fruit. Virtually all Serbians brew their own rakija at home and if they don’t they have another family member who does. They are all very proud of their home brews and you’ll find yourself being given a glass at every opportunity. It can be made from any fruit and often you can taste the subtle fruit flavours under the strong alcohol. Yes, it’s potent at anywhere from 40% – 65%! I have tried pear, peach and plum – peach being my favourite, but it can also come in any of these flavours – apricot, grape, fig, quince and even juniper. Belgrade is full of the funkiest and quirkiest cafes and bars. Wander down any street and you’re sure to find an enticing looking place to sit down, have a coffee and relax after a busy day’s sightseeing. There is Wall Art everywhere you look, sometimes it huge, covering an entire wall, sometimes it’s just a small but powerful message. Keep your eyes open to see what you can find. In Skadarlija Street you will find a brass statue of the poet Djura Jaksic. It’s an urban legend that if you sit on Djura’s lap and whisper your wish to him, it will come true. Try and see it yourself. All of the above attractions are within walking distance of each other, so if you start at Belgrade Fortress and work your way South, you can easily do it all on foot. The buses are a bit confusing, but there are lots so that is another option. And lastly, there are taxis for those not keen on walking. 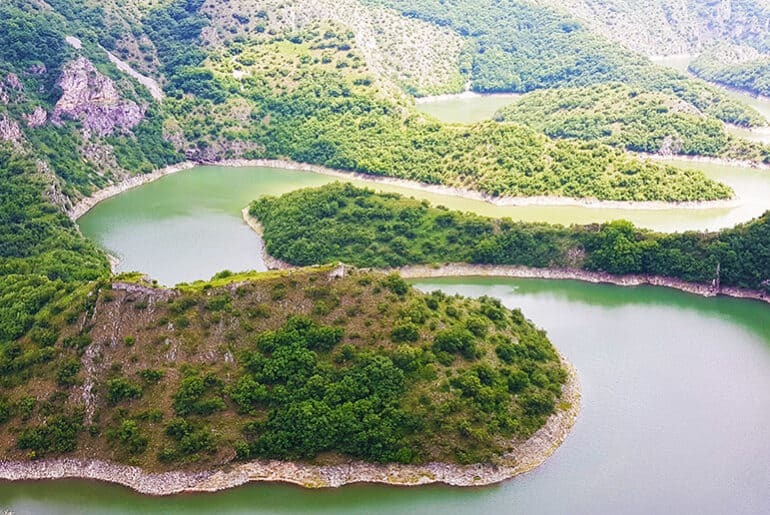 Belgrade is located almost in the center of the Balkans, making it the perfect base from which to do day trips in Serbia or to any of the neighbouring Balkan countries. 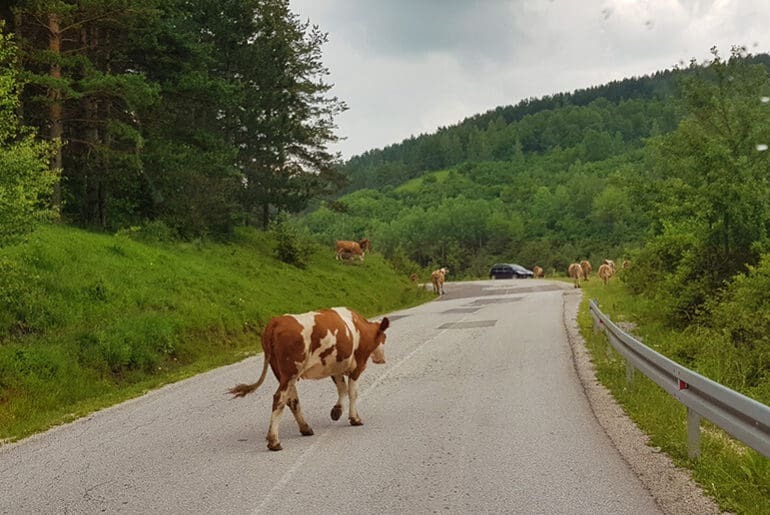 The multitude of things to do in Belgrade will keep you very busy, but make sure your stay is long enough to allow you to explore the other fascinating places in Serbia and perhaps a few quick visits to Montenegro, Albania and Croatia.